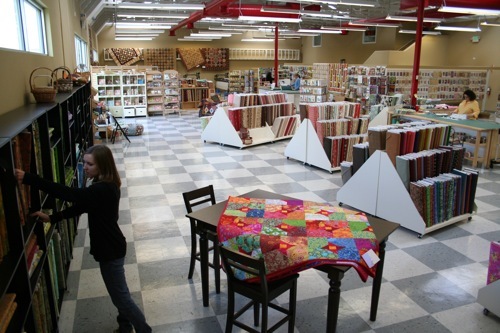 Quilt Expressions is a full service quilt shop located in the middle of Boise, in Garden City. The store is always buzzing with activity, especially with five Gammill long arms that are used for classes, renting to our customers, or for our professional quilting services. As a certified Gammill representative, be sure to talk to us if you’re considering purchasing a long arm quilting machine. In the shop, you’ll find many quilts on display, plus 5,000+ bolts of 100% cotton fabric, quilting books, patterns, supplies and kits. We have a very knowledgeable staff and an extensive inventory of everything quilting, plus an inspiring collection of bag, jacket and skirt patterns and supplies. We’re happy to help on any project, from a simple pillow case to an heirloom quilt. And while we always are happy to see you in the store, our online quilting store allows you to shop with us wherever you are, and at your convenience. Visit us on the web at www.quiltexpressions.com. We’re sure you’ll find lots to love! Our shop is open for shopping Monday through Friday, 10-5:30 p.m., and Saturday from 10-4 p.m. The shop is closed on Sundays. Stop by, introduce yourself and tell us what you’re working on. We’d like a chance to get to know you.